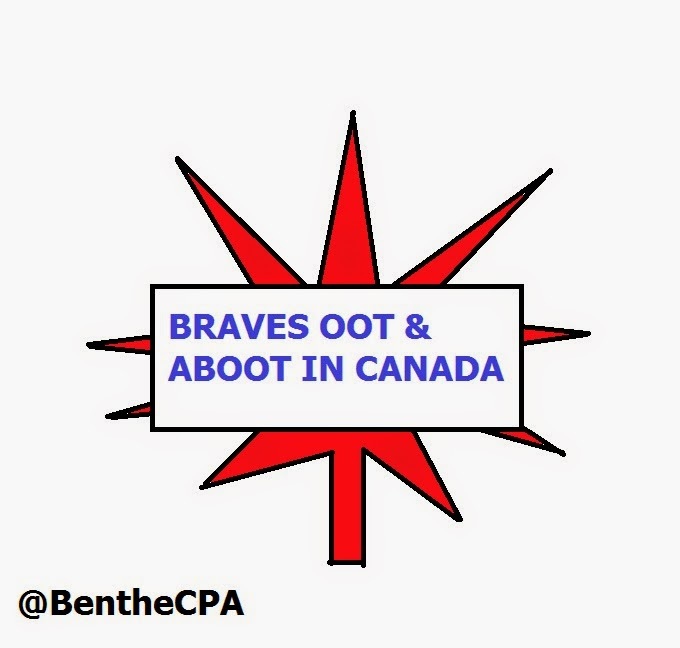 The Braves are heading north of the border, eh? Gonna have some poutin and grab a few Molsens while they are oot and and aboot! That's Canadian talk for grabbing beers and fries when you go to the bars. Oh Canada. America's hat. Julio Teheran takes the mound for the third time this season, and he's already sporting a 2-0 record. Julio's got a 1.50 ERA on the season with a 1.25 WHIP, holding opponents to a .238 average with 9 Ks. He's certainly earning the reputation as the team's ace. He's also going to need to be the team's stopper as the Braves are in a two-game skid. Facing him is Drew Hutchinson, a pitcher with two wildly differing starts. In his first game, Drew pitched 6 innings of 3 hit, 1 run baseball. In his second outing, he got knocked around for 7 earned run in 4.1 innings. So, I have no idea which Drew is going to show up. However, I do know that most of these Braves have limited looks at him, except Nick Markakis who has a paltry 5-22 line. We'll need more than that to win in an AL interleague game. Alex Wood looks to bounce back from his mediocre start against the Mets where he got a no-decision giving up 3 runs in 6.2 innings. Almost nobody on the Blue Jays have ever seen Wood, and those that have don't have any success, to the tune of zero hits in 8 combined ABs. Wood has a really funky motion (I'm being polite there) so I have to believe that guys never seeing him is a big benefit to Alex. On the other side is RA Dickey. That name should be familiar to Braves fans as he used to pitch for the Mets before getting signed by the Blue Jays in 2013. Dickey found something of a Elder Statesman Renaissance of his career with the Mets, but at this point he's a 40 year old pitcher throwing spitters in the AL. That's tough for even young guys. Plenty of the Braves have seen Dickey and guys like Simmons, AJ, Freeman, Markakis, and Kelly Johnson all have over .800 OPS against him. I think this matchup favors the Braves. The last game is another shot for Shelby Miller to get a win. The Braves are 2-0 in his first two starts, and Shelby currently has a sub-1.00 ERA. He's been everything we wanted and more in the early results. Here's the key for Shelby in this coming game: Don't pitch to Russell Martin. Martin is 5-16 with a double, two homers, 4 RBIs, and 3 walks off Miller lifetime. That's a wrecking ball, and nobody else on the Blue Jays is even close. I'd avoid him at all costs. Daniel Norris is the Jays pitcher, and he's a 21 year old basically rookie with 17 innings of total MLB experience. Notoriously, the Braves have been bad against newbie starters they've never seen. We'll get to see how this season plays out with that situation very early. Will it be better? I have no idea. The CPA is now 4-2 after going 3-0 on the Marlins series picks. I had hoped it would be wrong, but here we are. If you're betting, the CPA is also +1.8 units on the picks so far. Let's see if it keeps that up! CPA thinks the Braves will drop another series. But it's not as confident about the last game. Maybe we'll see the Braves steal a couple on the road with the DH in effect.